Photo Credit Lombard - SANTA MARIA BAY -- shows her glorious colors at sunset. This is one of the sailor's favorite photos from a beautiful voyage to Cabo San Lucas. My friend John Kutschka has had this long-standing dream to sail away from it all. At the beginning of the decade, he started getting everything in place. Convincing his wife Lauren was priority #1 with the selection of a sturdy boat, #2. The mistake most people with the same dream make is they shove off before they should. The result usually is a crisis in the marriage or at sea. Not John, who is a very fastidious engineer who plans every detail. In 2003, he purchased a brand new Hallberg-Rassy 43, an exceptional blue-water boat capable of sailing the world. He had made this choice after taking an offshore sailing course from Hawaii to Tahiti in almost an identical boat. After a season or two plying the waters of the Northwest around Seattle, they loaded up the boat with supplies and every redundant electrical or mechanical system available to be ready in the fall of 2004. John retired and Lauren left her high-paying executive job at Costco. Photo Credit Lombard - UNDERWAY -- Velocity (italicize) -- John and Lauren Kutschka's Hallberg-Rassy 43 -- leaves Newport Beach, Calif., on the start of a cruise first, to Cabo San Lucas, then on to the South Pacific for three years of sailing. The plan was to sail the South Pacific for three years. Frequently, cruisers sail down the U.S. coast to central Mexico before departing on the �milk run� to the Marquesas. It is very common to join a loosely formed group called the Baja Ha Ha in Southern California sponsored by the magazine Latitude 38. This party fleet of 200-plus boats then can travel and race safely together down the starkly beautiful, but desolate, Baja California Pacific coast. Timing of Baja Ha Ha departure did not work for John and Velocity. This meant to get the boat south he had to travel alone and needed experienced friends to take journey legs with them. I volunteered for the Baja portion as sailing the coast of Washington and Oregon in November did not sound especially pleasant. My wife Shelia decided to opt out entirely and fly to Cabo to meet me upon our arrival. After skiing at Sun Peaks for two weeks over the holidays, I arrived in Orange County, tired but happy. 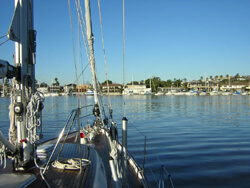 Velocity was moored in Newport Beach ready to go. The next morning, Jan. 12, we were off � along with the Kutschka�s friend from the Midwest, Ken. Unfortunately, Ken did not have any sailing experience and was in very poor health, just recovering from surgery. My first thoughts were there is no place to stop and get medical treatment on this journey and hope we did not face a burial at sea. To make matters worse, I soon discovered sleeping below was impossible with his constant hacking cough and boat-shaking snoring. Our first day after clearing the harbor channel was mostly motor sailing with light winds. Recent Santa Ana winds had scoured the smog out the LA basin so that the distant mountains gleamed brightly with their new coating of snow. Traveling offshore a couple of miles in a moderate swell and light northerlies, we crossed the border at dusk, watching the twinkling lights of San Diego and Ensenada. In a southerly direction you can usually expect winds astern for a comfortable ride. In the other direction, it is often a very uncomfortable beat and avoided by most cruisers. It was startling to see all signs of civilization disappear after Ensenada. The nights revealed a pitch-black shore with no lights and a brilliant sky full of stars. Starlight did allow you to see wavelets and just make out the horizon. You had to believe how difficult it must have been for ancient mariners to keep this close to shore without fear of disaster. Probably the answer would have been to keep far at sea and approach land only in daylight. Fortunately, dual GPS chart plotters, autopilot, radar and a connected laptop gave us almost peace of mind, hurtling along at 8 knots in the blackness. The laptop with GPS software would show a detailed chart with a boat symbol moving in the middle with a breadcrumb trail of where you have been and an arrow of where you are going. Later that first night, we would see a faint low light eerily appearing on the horizon, bobbing on the swell. As we approached, we observed through the binoculars that it was the first of many small, open Mexican fishing boats called pangas. They commonly fish at night, using only a lantern sometimes covered with a paper sack. One of our entertainment devices used to make your night watch go by faster was soon confined below. A portable DVD player in the cockpit so blinded those above deck that night vision disappeared, making the pangas invisible. It was decided that night story telling and listening to the VHF clattering away with a frustrated Norwegian cruise ship captain trying to get clearance to enter San Diego was also fun. The next morning, John and Ken were anxious to try some fishing. John had purchased Mexican licenses for everyone and was thinking wahoo for dinner. Actually, anything that could grab a hook barreling along at 8 to 9 knots without ripping its mouth out was fair game. Fairly soon, a small dorado was on the line. After it was netted, bashed to death and cleaned, it left a rather bloody stern, marring Lauren�s beautiful home. With much scrubbing, the boat again sparkled and everyone was forgiven. Later, a small tuna hung on to be caught and became a great sushi dish of ahi. The same afternoon we were weaving in and out of several pangas. Suddenly we slowed dramatically as we passed one that we had given, what we thought, to be a wide berth. Looking down at the rudder revealed lots of yellow line and net. Before we could react, a panga with very excited fishermen roared alongside, screaming for us to stop. After some frustration by both sides that nobody understood each other, one Mexican put a knife in his teeth and jumped into the ocean. Diving beneath our boat, he quickly slashed the tangled lines, gathered their damaged net, climbed back into their boat and sped off. With disbelief and relief, we resumed our way. On the afternoon of the 14th, we approached the horn of Baja. Passing inland of Isle Cedro and Isle Navtividad, we were close to our first stop of Turtle Bay. This little hamlet would allow us to refuel and anchor for the night with some welcome sleep. We knew it would be close attempting to enter the harbor and get anchored before dark. Entering a strange harbor at night is not recommended. It took good coordinating among the crew to navigate the entrance using visible channel nav lights, radar and the C-map GPS software. Once we were through the channel, the bay is large enough that anchoring in the dark was rather straightforward. We woke to a beautiful sunny morning. The first chore was to get the remains of the net still wrapped around the prop cut away. John donned scuba gear, dove and finally surfaced without success as the line was caught between the prop and shaft. Fortunately, one end of the line was long enough to reach one of the winches. After some grinding on the winch, it was pulled clear. The local diesel fuel boat arrived and we filled up. Photo Credit Lomabard - ONCE A PIRATE -- always a Pirate. David Lombard was a Yakima High School (Wash.) "Pirate" in his youth and has lived up to the name with 45 years of extensive sailing: from Victoria, B.C., to Lahaina, Maui, Hawaii, down the West Coast to Cabo San Lucas (see story), and several weeks in the windward islands of the Caribbean. Here, he is shown with his grandson Ben Dysart (whose other grandfather was the mission control director for Apollo 12 and 14) at the helm of Will O' Wind . We went into the village, a favorite of the Baja Ha Ha fleet. This place is out of the Old West. We walked the dirt streets of the town finding a tiny bakery / market and bought local sweet buns and tortillas. Later we stopped at a little waterfront bar for some refreshing Coronas. That evening back at the boat, we were treated to a spectacular show by diving pelicans while we enjoyed rum and coke in the cockpit. The odd departure time of midnight was planned to enable us to reach our next anchorage Bahia Santa Maria during daylight hours. Letting the others sleep, John and I pulled the anchor, and we stealthily slipped through the entrance buoys to make our way out into the Pacific once again. Nighttime was so black that it was easy to become disoriented. Besides the Mexican fishing fleet, we soon discovered brightly lit cruise ships headed our way. Velocity has very sophisticated radar with software called MARPA that could track ships in your vicinity and give you information on any impending collisions. One cruise ship looked like a city block coming our way, and MARPA let us know it to be too close for comfort. The first inclination is to change course. Our mistake was not to adjust our course with the auto helm but to begin manually steering. It was partly due to our distrust of the auto-helm self-steering that had a mind of its own changing direction unprompted suddenly 90 degrees a couple of times previously. Similar to an airplane in the clouds, the vertigo was immediate. By taking our eyes off the compass only a moment, we found the cruise ship one second on starboard and the next to port. Fortunately, we soon discovered our own erratic steering to be the cause of this phenomenon and reset the auto helm with an adjusted course. We did indeed arrive at the entrance of Bahia Santa Maria with plenty of daylight. During the season of annual migration south, this could normally be a crowded anchorage. In January, we were alone as if we were the only boat on the ocean. After settling in, we launched the inflatable and explored the beach as if we were Robinson Crusoe and Friday. 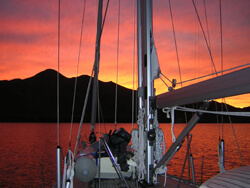 Back aboard that night, we were treated to the very best of the many spectacular sunsets. Night came suddenly as if someone had turned off the lights. Sleep came as quickly for all the exhausted sailors. A short hop the next day, we arrived at Magdalena Bay on Jan. 18. This is the famous birthing site of grey whales. We were not disappointed as whales began surfacing all around the boat for a spectacular show. They became so thick we were forced to slow to a crawl with lookouts to make sure there was not a collision. Also, now we were seeing sightseeing and sportfishing boats out of Cabo. Another secluded anchorage and exploration of the beach made for the perfect day. Temperatures had warmed significantly now that even the nights were comfortable. By morning, we were off with only one more day and night to go to our destination. That night the clouds thickened, and we began experiencing rain squalls. With increased vessel traffic, we had to be especially vigilant. Visibility decreased and our MARPA radar warning system tried to fool us occasionally with false collision alarms that turned out to be only rain squalls. The dawn broke upon a bluebird day. We were close enough to shore to see the white foam and hear the tremendous roar of the huge surf. I learned later this is some of best surfing anywhere and also the site of many tragic shipwrecks. Now motoring, we finally spotted the amazing famous pillars of Cabo San Lucas. Vessels of every description were everywhere as we motored up the channel to obtain a slip in the marina. Timing was absolutely perfect so that I was able to catch a ride to the airport with friends to meet Shelia arriving from Seattle. Ken survived the adventure and also caught a flight home. The next few days were spent exploring and day sailing. Some good friends from Seattle let us use their beautiful condo the rest of our stay. A king-size bed and hot showers were just what the doctor ordered. On Monday, Shelia and I wished John and Lauren well on the rest of their voyage and caught the Alaska flight back to Seattle. Editor�s Note: The writer is a childhood friend of the editor, both having grown up in Yakima, Wash. As the cruising season begins, it is a pleasure to present the experiences of those who have actually �been there, done that.� Our thanks go to David Lombard for this narrative of a memorable adventure. Also, Lombard mentions that he and his wife love skiing. They have a ski-in/ski-out condo in Sun Peaks, located east and north of Whistler. It has just been named the 10th best resort in North America by Conde Nast, a travel publication. The Lombards do rent it out and suggest our readers visit Rental Infomation for more information.